In the pursuit of living more eco-friendly lives, many residents in Weber, and throughout all of Utah are looking for alternative energy sources. The most obvious, of course, is solar energy. With so many days of sunshine in Weber, it seems silly not to take advantage of them! But if you’re still on the fence as to whether you should switch to solar power for your home or business, we hope this blog will convince you to make the switch! We know a few things about solar panels and power, after all, Gardner Energy has helped the people of Utah embrace solar technology for more than a decade. Solar panels are a sound investment for a lot of reasons, and one of the best is the value it adds to your home. The US Department of Energy conducted studies and found that adding solar panels to your home can increase its value by up to $15,000. That’s a significant increase. Similarly, other studies, conducted by the National Renewable Energy Lab on real estate have found that homes with solar panels sell faster, and at higher prices than homes without them. Perhaps one of the most commonly cited reasons for switching to an alternative energy source, going solar can help to reduce the amount of pollution in our environment. Traditional power relies on fossil fuels and other harmful chemicals to produce our power. 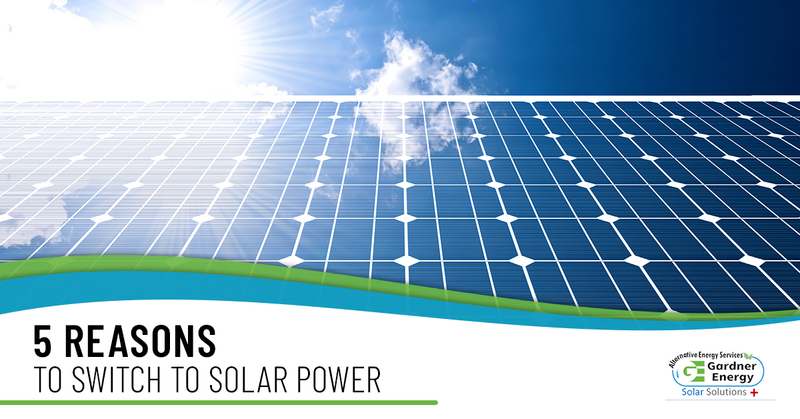 Solar power has no by-products and no harmful pollutants. The power from the sun is free, clean, and renewable, ensuring that we can keep our planet healthy. No one likes the idea of tax season, but you can make it a little more palatable by taking advantage of the tax credits offered by the US Department of Energy, as well as the state of Utah. These are great incentives that reward you for your eco-friendly commitment to using alternative energy sources. What many people don’t realize is how durable a solar panel system is. Solar panel arrays and systems require virtually no maintenance or costly upgrades. It’s not uncommon for a single system to last for 30 years without any issues at all! It’s a worry-free system that you won’t have to spend time managing. The economy of Weber and Utah is aided by those who choose to switch to solar power systems. There’s a need for skilled and trained workers, who can bring their talents to a growing and important field. Not only does switching to a solar system help the environment, it helps your neighbors, too. We hope you’ve found this blog helpful. We’re passionate about helping our customers find new ways to reduce their dependence on traditional power sources and use renewable energy to power their lives. In addition to solar panel systems, we also offer our customers our wind and hydro-electric systems. If you’re ready to switch to solar power, or another alternative energy source, contact Gardner Energy today and be sure to ask us about our financing options.